The AptaSystem® is a point-of-care test (POCT) platform that detects pathogens specifically in body fluids. The identification occurs via a groundbreaking, patented, conductive polymer and aptamer-based all-polymer chip technology. The AptaSystem® is based on an electrical measurement in a lab-on-a-chip system (AptaChip®), which is inserted into the reader device (AptaViewer®). Rapid, ready-to-go infectious agent detection: The AptaSystem® is fast. The user can get diagnostic results for decision-making with laboratory quality in point-of-care/point-of-need settings within 10 minutes without complicated and long sample handling. The targeted accuracy of the AptaSystem® is in excess of 95% sensitivity and specificity. 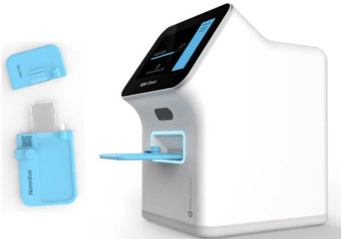 This rapid and accurate diagnosis allows fast and appropriate treatment of patients, preventing the unnecessary use of antibiotics, affirming the need for isolation of a patient, or hindering the spreading of infections. Aptamer-based target detection: The AptaSystem® will be the first commercial medical product using aptamers (short, single-stranded oligonucleotides) for target capture. Aptamers offer several key advantages over the generally used point-of-care recognition elements, which are mainly antibodies. Aptamers are selected by in-vitro methods, and their production is therefore cheaper and faster than antibodies. The chemical and physical stability of aptamers also overcomes the respective properties of antibodies. Therefore, the AptaChip® can be stored in ambient conditions for long periods of time without deterioration. Biosensor formulation: The AptaChip® is based on conductive polymer electrodes allowing electrical detection of aptamer target-binding events. The AptaChip® uses a novel mechanism of binding aptamers to electrodes, which has been developed at Solsten Diagnostics A/S. Communication with databases: The AptaViewer® is equipped with an internal QR scanner which can read user ID, sample ID/patient ID, and the AptaChip® ID, to ensure traceability of the test. These data – along with the test results – can be sent to any database via secure Wi-Fi communication. Digital registration of the data also offers the opportunity for analyzing large amounts of samples from different sites in a healthcare network, enabling evaluation of the spread of infections, the coverage of vaccination, etc. Versatility: The AptaSystem® is a platform technology and has the potential to be used for the detection of any pathogen. The AptaChip® platform can be produced as semi-manufactured articles without a specific function. The chips can later be functionalized with requested target pathogens to meet the actual market needs within a short timeframe at minimal cost. New applications can also be developed based on the AptaSystem® platform.